This is a 1996 Parker Prototype Duofold Centennial cartridge/converter-fill in Black with rare Brass Overlay with “Grapes on Vine.” Charles Heidsieck Winery (UK) wanted a pen to give to their customers and asked Parker to produce several samples from which they could choose. This is one of the prototypes they did not select. GPT. 18K, fine nib. New-old-stock. Mint. While the date code on the pen is 1987, the prototype is from 1996. Converter included. Item #197 in Catalog #82. 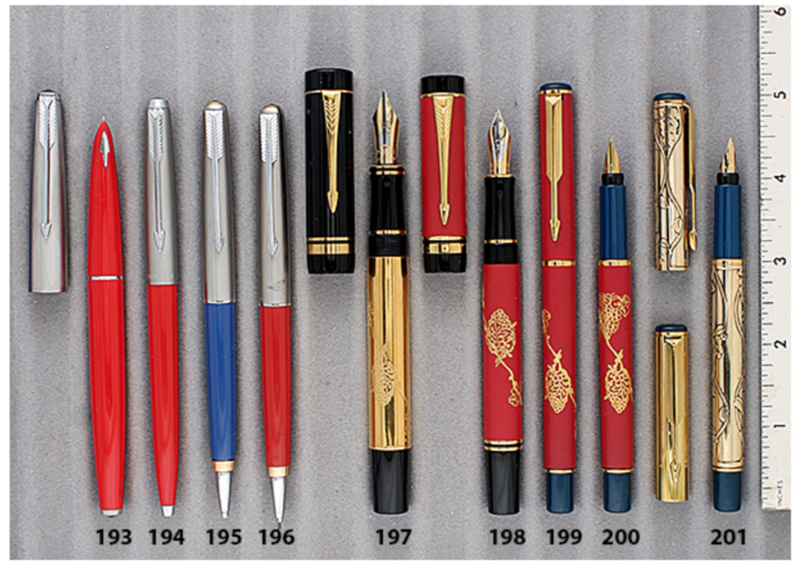 This entry was posted in Vintage Pens and tagged Catalog, Catalogs. Bookmark the permalink. Follow any comments here with the RSS feed for this post. Post a comment or leave a trackback: Trackback URL.